The unemployment rate fell only because more people stopped looking for work, and government cuts will likely hurt more companies with federal contracts in the coming months. WASHINGTON — A streak of robust job growth came to a halt in March, signaling that U.S. employers may have grown cautious in a fragile economy. The gain of 88,000 jobs was the smallest in nine months. Even a decline in unemployment to a four-year low of 7.6 percent was nothing to cheer: It fell only because more people stopped looking for work and were no longer counted as unemployed. The weak jobs report Friday from the Labor Department caught analysts by surprise and served as a reminder that the economy is still recovering slowly nearly four years after the Great Recession ended. “This is not a good report through and through,” Dan Greenhaus, chief economic strategist at brokerage firm BTIG, said in a note to clients. March’s job gain was less than half the average of 196,000 jobs in the previous six months. This could be the fourth straight year that the economy and hiring have shown strength early in the year, only to weaken afterward. 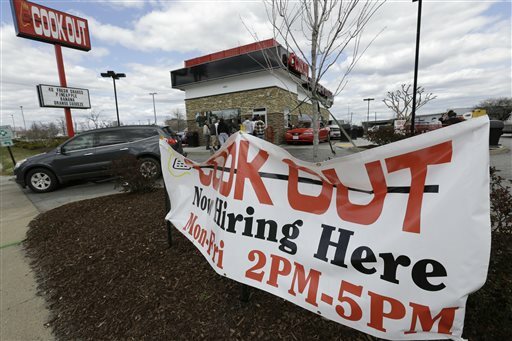 Some economists say weak hiring may persist into summer before rebounding by fall. The percentage of working-age Americans with a job or looking for one fell to 63.3 percent in March, the lowest such figure in nearly 34 years. Stocks plummeted after the report but then narrowed their losses later in the day. The Dow Jones industrial average closed down about 41 points. Broader indexes also declined. The Labor Department uses a survey of mostly large businesses and government agencies to determine how many jobs are added or lost each month. That’s the survey that produced the gain of 88,000 jobs for March. The government uses a separate survey of households to calculate the unemployment rate. It counted 290,000 fewer people as unemployed — not because they found a job but because they stopped looking for one. That’s why the unemployment rate fell. The percentage of working-age adults with a job or looking for one is a figure that economists call the participation rate. At 63.3 percent, it’s the lowest since 1979. Normally during an economic recovery, an expanding economy lures job seekers back into the labor market. This time, many have stayed on the sidelines, and more have joined them. The share of women working or looking for work, after expanding from the early 1950s through the mid-1990s, has plateaued. Fewer teenagers are working. And some who have left the job market are getting by on government aid, particularly Social Security’s program for the disabled. Heidi Shierholz, an economist at the liberal Economic Policy Institute, said the labor force participation among those ages 25 to 54 — “prime age” workers — has dropped to 81.1 percent. It hasn’t been lower since 1984. Gary Burtless, senior fellow in economic studies at the Brookings Institution, noted that some Americans have likely stopped looking for work because their unemployment benefits have run out. People must be looking for a job to qualify for unemployment benefits. “If people aren’t collecting benefits, they have one less reason to be out pounding the pavement looking for a job,” Burtless said. If the economy slows this spring, it would follow a pattern of recent years. An intensifying European financial crisis depressed hiring in 2010. Japan’s earthquake and tsunami also disrupted U.S. manufacturing in 2011. Last year, an unusually warm winter caused employers to do more hiring early in the year, cutting into hiring that normally happens in spring. This year, steep government spending cuts that began taking effect March 1 could have the same effect. But some economists say they expect any weakening this spring to be milder. The economy has a stronger foundation now. Housing is recovering, and consumers are spending more. Rising home prices and near-record-level stock prices are making consumers feel wealthier. Construction firms have also added 169,000 jobs in the past six months as home building has accelerated. “The recovery is on much better footing this year than in the last few springs, and the recovery in the housing market will do much to support growth,” said Sophia Koropeckyj, an economist at Moody’s Analytics. Economists also cautioned against reading too much into a one-month slowdown in hiring. The higher revised job totals for January and February suggest that some hiring might have again occurred earlier in the year than usual. Job gains have averaged 168,000 in the past three months, close to the trend of the past two years. Sluggish job growth could embolden the Federal Reserve to keep borrowing costs low for the long run. The Fed has said it plans to keep short-term interest rates at record lows at least until unemployment falls to 6.5 percent — and Chairman Ben Bernanke has said a 6.5 percent rate is a threshold, not a “trigger,” for any rate increase. The Fed wants to see sustained improvement in the job market. Friday’s report showed hiring was stronger in January and February than previously estimated. January job growth was revised up from 119,000 to 148,000. February was revised from 236,000 to 268,000. Several industries cut back sharply on hiring. Retailers cut 24,000 jobs, manufacturers 3,000 jobs. Some economists said retailers might have held back on hiring in part because March was colder than normal. That likely meant that Americans bought fewer spring clothes and less garden equipment. The oil and gas industry has been adding jobs fast over the past several years but cut jobs in March for the first time in 2½ years. Oil drilling and exploration is booming, but low natural gas prices over the last year have made natural gas drilling in some areas unprofitable. Most analysts think the economy strengthened from January through March, helped by the pickup in hiring, a sustained housing recovery and steady consumer spending. Consumers stepped up purchases in January and February, even after Social Security taxes rose this year. At the same time, some small businesses say they’ve grown more cautious about hiring. The government spending cuts could cut into sales at companies with federal contracts and at small retailers located near government facilities. And small business owners worry about increased health insurance costs next year, when the government’s health care overhaul is fully implemented. A survey released Wednesday by the National Federation of Independent Business showed that fewer small businesses plan to hire. As federal agencies and contractors cut back in coming months, Nariman Behravesh, chief economist at IHS Global Insight, expects job growth to average 100,000 to 150,000 a month, down from an average 212,000 from December through February. “The good news is that this is happening at a time when the private economy is gaining momentum,” Behravesh said. He expects hiring to pick up after mid-year. Craig Alexander, chief economist with TD Bank Financial Group, said the economy isn’t growing fast enough to generate enough jobs. He expects the economy to grow around 2 percent this year, a sluggish pace. He thinks it would be growing faster, perhaps at a 3 percent annual rate, if not for the Social Security tax increase and the federal budget cuts. “Fiscal austerity is having an impact,” Alexander said.